Water pumps are used for in the cooling systems of the car. They have centrifugal architecture ran by a belt that is attached to a crankshaft. It drives water or coolant through the engine, block and through the cylinder, water or coolant goes into the radiator before it comes back into the pump. A timing belt is what runs the water pump. This belt turns the pulleys outside your water pump, that then turns pulleys inside which creates a centrifugal force that keeps the water/coolant moving through your engine. That means your water pump runs as long as your engine is running. 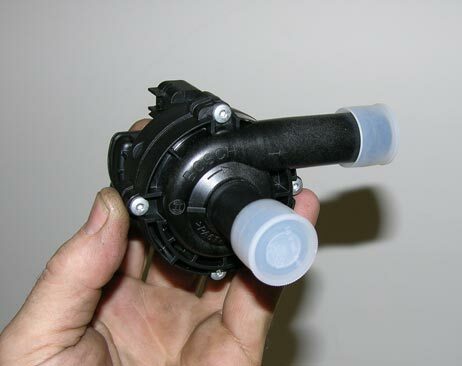 Water pumps can have problems, and it’s important to know when they need repair or replacing. Watch out for leaking coolant, that means something is wrong with your pump. Or if your water pump gets really noisy. The impellers inside could be damaged or working improperly. If you take your car for service constantly, your mechanic will likely let you know if something’s wrong with your water pump. Other times the belt running the pulleys may start fraying and you need to change to avoid it cutting. There are many water pump manufacturers, but Bosch makes OE style water pumps. If you’re replacing your water pump, a Bosch Water Pump will be the best fit because they have the best aftermarket parts. Bosch manufacturers their water pumps with the care to withstand your engine’s hot temperatures. They use a unitized fastener that protects your water pump from leaking or any sort of contamination. They are new in the box when they come to you; there is no part that is remanufactured. Bosch vacuum-leak-test their water pumps to make sure they are completely sealed, they must pass this test before they are allowed the parts out for sale. Before you buy the part, check your car’s manual to confirm the specifics of the water pump your car needs.